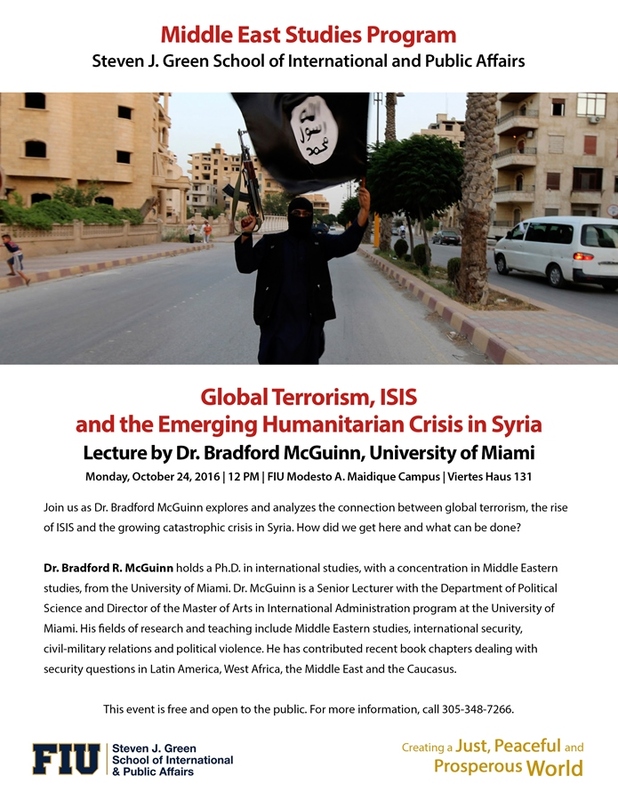 Join us as Dr. Bradford McGuinn explores and analyzes the connection between global terrorism, the rise of ISIS and the growing catastrophic crisis in Syria. How did we get here and what can be done? Dr. Bradford R. McGuinn holds a Ph.D. in international studies, with a concentration in Middle Eastern studies, from the University of Miami. Dr. McGuinn is a Senior Lecturer with the Department of Political Science and Director of the Master of Arts in International Administration program at the University of Miami. His fields of research and teaching include Middle Eastern studies, international security, civil-military relations and political violence. He has contributed recent book chapters dealing with security questions in Latin America, West Africa, the Middle East and the Caucasus.